No guy's casual wardrobe is complete without a favorite pair of cargo pants. Haggar's Stretch Comfort Cargo Pants live up to their name with fabric that gives a little — and a hidden expandable waistband that gives a little more. They not only feature cargo pockets on the thighs,but there's an extra tech pocket for your phone. A flat front and classic fit complete the look. Premium No Iron Khaki is rated 4.5 out of 5 by 146. Rated 3 out of 5 by Anonymous123 from Sizes seem to differ Sizes seem to differ with every style and pair. Order 3 pair of this style in same size but different color. All 3 are different sizes. Rated 5 out of 5 by Mike M from Premium No Iron Khaki Good quality and a good buy! Delivery was as promised. I am a happy camper!! Rated 5 out of 5 by Keyman from Seem to work well for him He works well in them at his part time position with Redner's supermarkets. 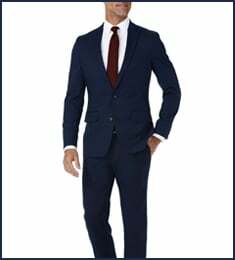 Rated 4 out of 5 by Jeep fan from Good purchase for work pants I have been searching for good business casual pants that maintain neat look and also do not need to be dry cleaned. Only had these a couple weeks but find them to fit what I was looking for. I find Haggar pants run big. I am normally 34x32, first order was too long and I could get away w/33" waist. Rated 5 out of 5 by Steve72 from Love these slacks! I've worn many khakis over the years, including Dockers and off brand, but these are some of my favorites! My body-type looks much better with pleats, and the stretch waist on these Haggars is a added bonus. I have three types of black Haggar slacks in my closet, but the no-iron khakis hold their CREASE better than any other. They are a very comfortable slack! Thanks, Haggar! Rated 5 out of 5 by Rider 1 from High Quality and Great Fit I purchased these pants online, having not tried them on in a store. When I received them, I was pleasantly surprised by the great fit and high quality. I love them! Rated 5 out of 5 by Mary57 from Great pants Hubby loves these pants! 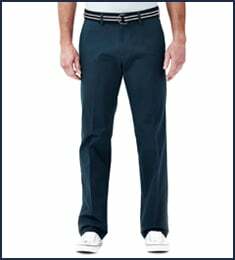 He wants a 31 inseam, and I am so glad that Haggar offers these pants in this length! The only improvement needed is to correct a problem with the crease on a couple of the six pair that I bought. 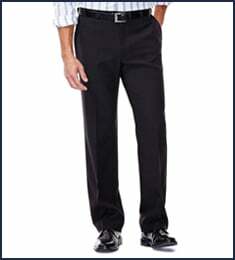 Rated 5 out of 5 by Skipper1 from Great dress pants! Already owned two pair of Premium No Iron Khakis. Bought two more!! 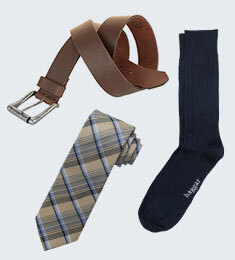 Great look, great fit, great price, great customer service, and easy to use website. A few minutes in the dryer on low is all you need....no iron! Can't go wrong buying these pants. Highly recommended.